Dinosaurs continue to capture the imagination of the young and young at heart. Even after more than 65 million years their legacy still captivates the mind and spirit. Dinosaur replica fossils are a great way to keep the wonder of these primitive creatures alive for any child or dinosaur enthusiast. Real dinosaur fossils are fragile to handle and expensive to purchase. In order to preserve fossils they must be kept in a stable environment and handled delicately. Replica fossils are made to be durable, realistic and affordable. Skilled artists create replica fossils by using real fossil finds as inspiration. For the instructor looking to create a more hands-on experience, replica dinosaur fossils offer a wide variety of educational uses. Replica fossils are made from sturdy material that can be handled by untrained hands. Detailed appearance gives replica fossils that life-like touch, making them virtually indistinguishable from the real thing. Replica dinosaur fossils are prefect for museums and science centers. Unlike real fossils, replica fossils do not need to be stored in a safe environment and only handled by trained professionals. The strength of replica fossils allows them to be put on display in any environment without worrying about damage. Visitors can get up close and personal with any replica dinosaur fossil in a variety of ways. 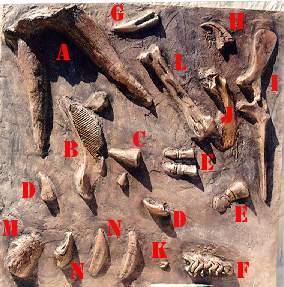 Smaller fossil replicas can be used in mock digs, gift shops and classrooms. Larger replicas will give visitors a view at just how large dinosaurs were, allowing the imagination to travel through time. Dinosaur replica fossils can turn a boring school lesson into an exciting journey through the ages. By bringing replica fossils into the classroom, teachers can stimulate the minds of students at any age. Children will benefit from the chance to let their imaginations run wild by working with replica fossils. Older students will benefit from the opportunity to view replica fossils closely, giving them a better understanding of the real thing. Having a tangible medium with which to explore the world of dinosaurs allows students a chance to discover exactly what the world was like when dinosaurs walked the earth. Replica dinosaur fossils can get just as much use outside the classroom or museum as they get inside. Private collectors can enhance their own personal collections with fossil replicas. Dinosaur-themed birthday parties become memories to treasure for years and years with replica fossils to hold on to. Replica fossils can be used in a number of ways, from room decorations to scientific displays, and from sandbox activities to thoughtful gifts. No climate controlled storage or fossil handling training required! No matter what the intended use, the stability of replica fossils will ensure a product lasting like the legacy of dinosaurs. While the chances of seeing a dinosaur live are slim, the fantasy still fuels the imaginations of many. Authentic dinosaur replica fossils are one way to bridge that same gap without fear of destruction.